On today’s episode, we welcome Dorothy Illson, host of The Do Well and Do Good Podcast. The show is focused on talking to guests who have achieved a level of financial freedom and use that opportunity to give back in some way. 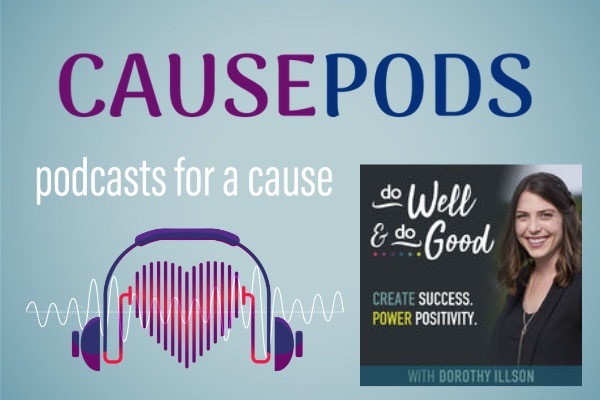 So Dorothy’s show is not all that different from ours here at Causepods, as she is highlighting great causes and the people behind them. Here at Causepods we believe in giving back too, and we want to support Dorothy and give to her chosen charity of choice: Village Impact. From their website: "Village Impact, formally known as World Teacher Aid, is a Canadian charity dedicated to bringing education to students in rural areas of Kenya. Partnering with the local Kenyan government and VICDA (a Kenyan NGO), Village Impact has successfully built 11 schools. That’s 88 classrooms in Kenya, giving over 3000 students a daily education. As an organization we chose to focus on education as it’s the gift that keeps on giving. Donate a classroom and it will be a gift for years to come.Our schools are not your typical school. Instead of just providing education, we make our schools awesome by fostering entrepreneurship. With this focus the kids then become the spark that reignites the growth within their communities and villages." For a great chat with a wonderful guest, be sure to tune in. Thank you for donating to Dorothy's charity of choice. Listen to this weeks episode here!